This evening I had about 1-1/2 pounds of beef loin top sirloin steak in the fridge that needed to be used. I decided to make Szechuan Beef w/ Broccoli. I sliced it into thin slices, seasoned it and used my stainless steel wok instead of my nonstick wok because I wanted to get that nice deep brown caramelization. I kept it very simple and decided not to make a sauce, just nicely seasoned. Since this cut of steak if tasty as is, I didn't need to go overboard seasoning it and it was tender enough that it didn't require any marinating. It turned out unbelievably delicious. I snapped a few photos below and included the easy peasy recipe. Enjoy! Heat 1 tablespoon oil over medium-high heat in a large wok. Season beef with salt and black pepper. 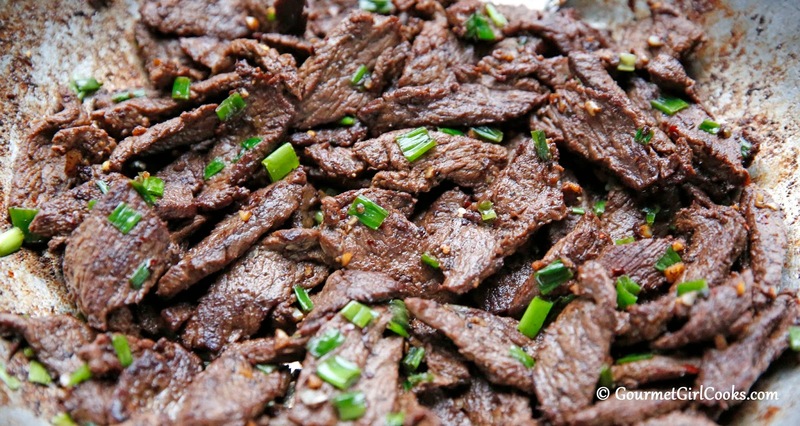 Add 1/3 of the beef at a time to the wok and cook, stirring frequently, until well browned. Transfer cooked beef to a plate. 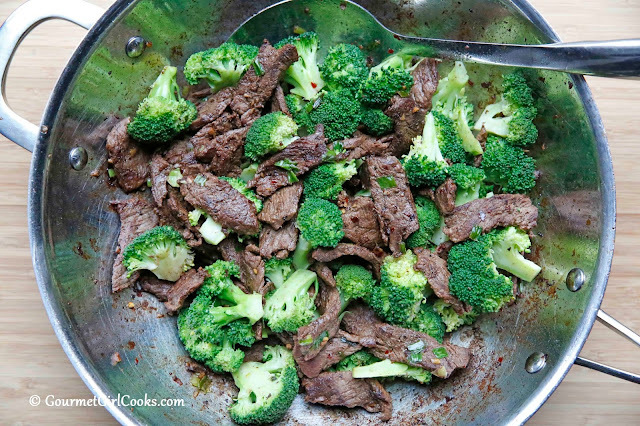 Add another tablespoon oil to the wok and repeat twice more, until all of the beef is cooked. Return all beef to the wok; add garlic and green onions. Cook, stirring frequently, for 2 to 3 minutes. 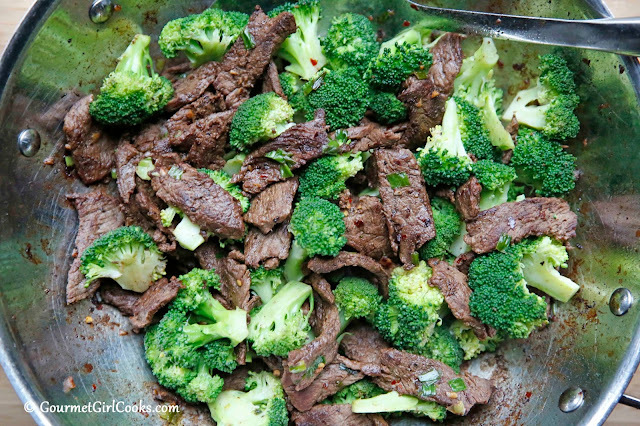 Add red pepper flakes, Tamari sauce, rice vinegar, steamed broccoli and 2 tablespoons water. Stir and cook until heated through. Please explain your thinking about the "crust" on the steak when you use your stainless steel wok vs. the non stick one. It isn't a "crust" but caramelization -- the searing and deep brown color that comes from making direct contact with the hot stainless steel pan where it initially sort of sticks to the pan before it releases as it cooks and browns. When I use my nonstick wok, it just slides around like it's on glass and doesn't make the same type of sear/contact that I get with the stainless steel wok.